Worsening trade tensions between the U.S. and China could bring more pain for the higher-yielding Kiwi, so I’m looking at this long EUR/NZD swing play. 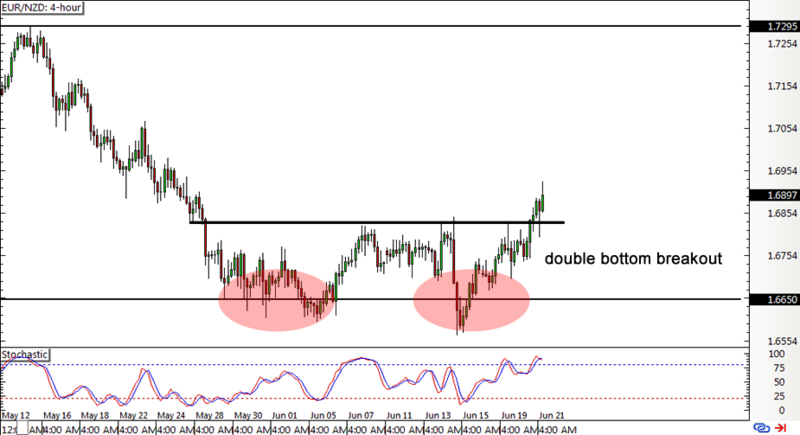 On the pair’s daily time frame, I’m seeing a neat bounce off the range support at the 1.6650 minor psychological mark. 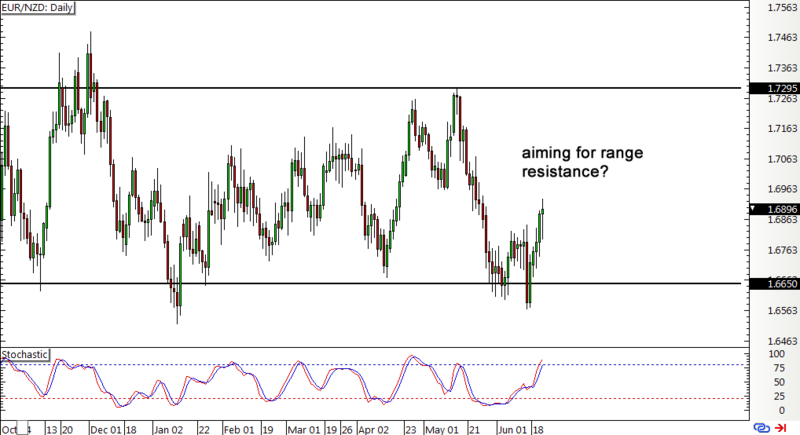 EUR/NZD might be setting its sights on the top of the range close to the 1.7300 handle if buyers stay strong. To top it off, I’m also seeing a double bottom reversal pattern on its 4-hour time frame, with price already busting through the neckline for confirmation. This chart pattern is approximately 200 pips in height, which suggests that the resulting climb could be at least the same size. However, stochastic is already in the overbought region on this time frame, so I’m inclined to wait for a bit of a pullback before jumping in. I’m keeping a bullish bias on the euro even though the ECB decision didn’t exactly pan out the way I expected. You see, the central bank announced a QE taper instead of a complete halt while Draghi was a bit vague about the timing of rate hikes. However, it’s still noteworthy to see a shift in the ECB’s monetary policy stance as it is now looking to reduce accommodation and is thinking about tightening at some point. The RBNZ, on the other hand, seems a long way off from doing so and it doesn’t help that trade uncertainties could derail their economic progress. Last time I checked, Trump is planning on slapping another set of tariffs on $200 billion worth of Chinese goods while China has pledged to respond with strong countermeasures. That can’t be good! With that, I’m hoping to catch a long position on this pair on a dip to the 1.6850 area, with a stop below the bottoms at 1.6600 and a target at the top of the longer-term range. What do you guys think?